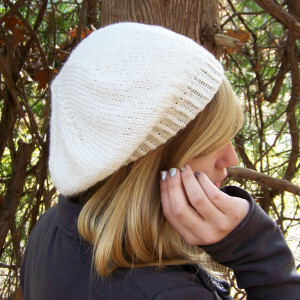 La Parisienne, is a truly feminine beret knit from worsted weight yarn. It features a well-defined twisted rib edge and simple stockinette stitch body adorned by a raised, decorative seven-point spiral decrease. La Parisienne is quick to knit and can be completed in an evening or two (or on a flight to Paris) using less than a single 3.5 oz (100 gr) skein of worsted weight yarn. 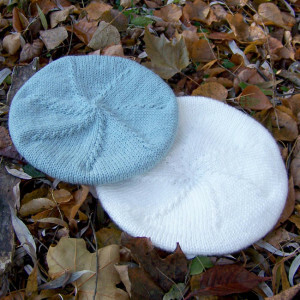 The petite sample beret (featured in Patons Classic Wool in Seafoam) used approximately 124 yds (114 m), while the slouchier version (featured in Bernat Satin Acrylic in Silk) used approximately 133 yds (122 m). This pattern is an excellent choice for novice knitters. It includes complete written row-by-row instructions and there are no charts to figure out. Instructions on how to adjust the beret for fullness are also included. Full pattern details for the La Parisienne Beret can be found here.